Back cover blurb: You can never know what goes on behind closed doors. Or can you? Holly never thought she’d move back to her home town, but then something terrible happened. She doesn’t know if she can recover. But she knows she can never tell another soul. People say her neighbour, David, is “different”. He doesn’t go out much, and never after dark. But in David Holly finds just what she needs: a friend. Someone who’s always there. No one knows Holly’s secret, or where she lives. She has left the past behind. She is sure of it. So why does she feel as though she’s in terrible danger? 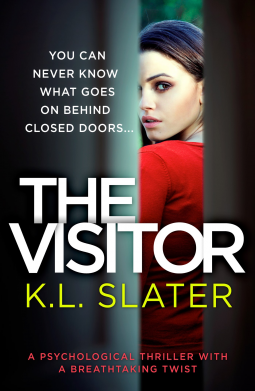 The Visitor is the latest psychological thriller from KL Slater. Holly is a timely visitor to Cora Barrett, a lonely old lady in Holly’s hometown of Nottingham. After the death of Cora’s husband, she has been lacking companionship. Holly’s misfortune is her gain, as she takes her in as a lodger after taking pity on her following an incident at the local post office. After escaping her troubled family life as a teenager and fleeing to Manchester with her friend Marcus, Holly hadn’t ever imagined she’d return to her hometown of Nottingham. But that was before she met Geraldine and Brendan and everything changed. David is Cora’s next door neighbour. He is intrigued by Holly’s arrival at the house and vows to get to know her better despite his own personal reservations about befriending a stranger. His Mother and those close to him don’t think he should get close to Holly but David doesn’t care. Holly and David begin to tentatively strike up a friendship. Holly feels safe with David, but she can’t shake the feeling that someone is watching her. Someone trying to track her down from her past. Someone that she doesn’t want to see ever again. I can’t say much more about The Visitor without giving anything away, so I’ll just this. The ending I didn’t see coming in a million years. Another brilliant K.L. Slater novel. The Visitor is available now via Amazon online and all good book shops.